Do you agree with our side? 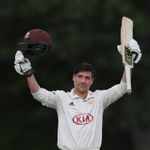 Rory Burns (Surrey – captain)Burns’ captain’s knock – his fourth century of the season – in Surrey’s first innings set the platform for the all-important victory over Warwickshire which sealed their first County Championship title since 2002. Tom Westley (Essex)Vijay was ably supported at the crease by Westley, who reached his first ton this season in the second innings off 193 deliveries. Gary Ballance (Yorkshire)Ballance formed a crucial partnership with Tom Kohler-Cadmore on Day Two against Lancashire when his side looked in dire straits at 27-3 in their second innings. Tom Kohler-Cadmore (Yorkshire)Kohler-Cadmore only made his county debut last season, but the man nicknamed ‘Pepsi’ had plenty of pop as he held his nerve to produce 105 not out in Yorkshire’s first innings against Lancashire – his second successive Championship century. The 24-year-old is improving all the time as a red-ball player and his stand of 148 for the fourth wicket alongside Ballance in the second innings turned the tide in Yorkshire’s favour.